Many times in today’s world there are often situations that someone has passed away and the event goes undiscovered for days, and even weeks before they are discovered. Sometimes it is due to the face that the deceased has no family to check in on them, or lead busy lives and don’t make contact with family or friends as often as they once did. Once the deceased passes away, the body rapidly decomposes leaving behind fluids that will saturate the area where they died. Couches, beds, flooring and chairs are most often where this occurs. What may seem like a small or simple stain on the carpet, is usually a much larger issue. The body’s fluids follow gravity and will typically absorb through the caret, padding and into the sub-floor. In some cases these fluids will penetrate into the room below the death scene. The odour in a death scene can be extremely overpowering and dangerous. Bacteria forms in these fluids and will make individuals sick that are not equipped with protective clothing and respirators. We use ozone, odorcides and a variety of different odour control techniques to remove and remediate the situation. Ottawa Extreme Clean is ABRA Certified and properly qualified to deal with death scenes, trauma scenes and Crime Scenes. 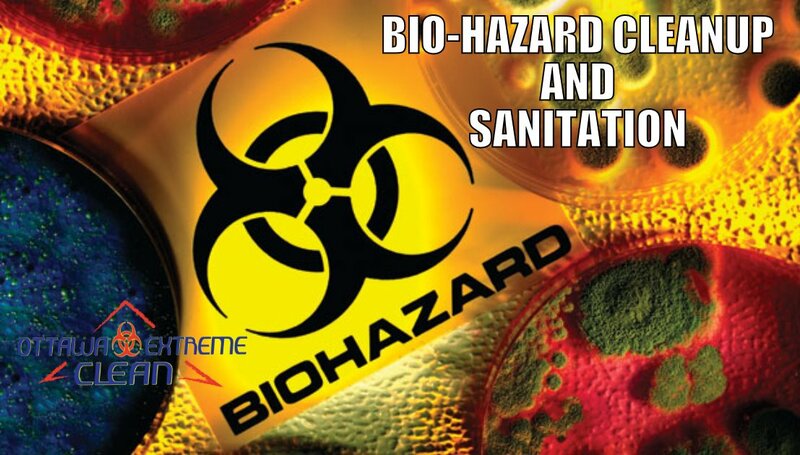 We are trained to deal with removal of saturated materials, structural cleaning and disinfection and odour removal that is due to undiscovered deaths.